A one-horned rhino has died weeks after it was shot by poachers in Nepal, becoming the first of the rare animals to be killed in the country in over two years. The injured adult male was taken to the Chitwan National Park, the country's biggest rhino conservation area, for treatment after it was shot in a forest in southern Nepal in August. But on Wednesday staff at the park said it had died of its injuries, becoming the first rhino to die at the hands of poachers since May 2014. 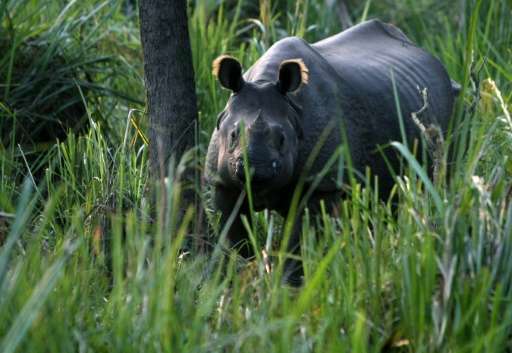 "The critically injured rhino had started to recover, but died Tuesday," said assistant conservationist Nurendra Aryal. Conservation groups had praised the Himalayan nation for its progress in combatting the poachers who kill the animals for their prized horns. Thousands of one-horned rhinos once roamed the plains of Nepal, but their numbers have plunged over the past century due to poaching and human encroachment of their habitat. The animals' horns are prized in China and parts of southeast Asia for their supposed medicinal qualities. Rhino poaching carries a maximum penalty of 15 years in jail and a 100,000-rupee ($1,000) fine in Nepal, which is now home to over 600 rhinos. Madhav Khadka, manager at WWF's wildlife trade monitoring department, said the death showed Nepal needed to improve security outside its national parks, where forest rangers guard against poaching. Game theory—does the rhino poacher or the gamekeeper win?